RE/MAX is born. Dave and Gail Liniger, two 20-something real estate agents from Denver, Colorado, decide to develop a new real estate concept. They created RE/MAX – an acronym for “real estate maximums” – a system that encourages quality real estate salespeople to realize and develop their outstanding business potential. RE/MAX is growing! 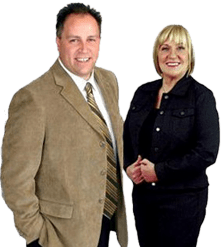 With a team of 42 Sales Associates , Gail and Dave Liniger decide to take the leap to next step to make RE/MAX the success they envisioned. They mortgage their assets and dedicate themselves to working around the clock. A huge company milestone when the first RE/MAX franchise is established outside of Colorado. On its 5th birthday, RE/MAX boasts 1,000 Sales Associates and launches its first widely recognized trademark – the RE/MAX Hot Air Balloon . And still to this day the Hot Air Balloon trademark is well known all over the world. RE/MAX grows beyond the US borders. Two Canadians -Frank Polzler and Walter Schneider contact Dave Liniger they want to bring RE/MAX to Eastern Canada. Liniger agrees, and RE/MAX Ontario-Atlantic Canada is born. Within two years the number of RE/MAX Sales Associates quickly triples. There’s now a total of 3,000 RE/MAX Sales Associates . The number of RE/MAX Sales Associates skyrockets to 20,000 and RE/MAX becomes the No.1 real estate organization in Canada . RE/MAX expands further with the opening of RE/MAX offices in the Caribbean . RE/MAX makes that big jump and “travels across the pond” to Europe . RE/MAX continues to grow world wide as the familiar RE/MAX sign begins to appear in real estate offices in Spain and South Africa . The RE/MAX network takes a bigger hold of the European marketplace with Italy, Israel, and Germany joining the “Above the Crowd” real estate experts. RE/MAX celebrates it quarter century birthday with 48,000 Sales Associates in 2,900 offices around the world. RE/MAX’s global reach now extends to Australia, Singapore, Turkey, the Southern United Kingdom and Ireland . The Netherlands and Greece join the RE/MAX Network. Prior to the new millennium Austria, Switzerland, Liechtenstein, Portugal and southern France join the RE/MAX Network. The year 2000 is celebrated with Norway and Iceland joining the team and spurring RE/MAX growth to over 57,467 sales associates in 3,422 offices in 32 countries on six continents. RE/MAX continues its continuous upward growth trend. The RE/MAX network can be found in 38 countries with more than 69,825 sales associates in 4,159 offices worldwide. RE/MAX heads into 2002 with over 5,000 Sales Associates in the Ontario-Atlantic Canada region. And with this success RE/MAX sales associates are happy to have been able to contribute over $12 million dollars to the Children’s Miracle Network since the inception of the RE/MAX Miracle Home Program in 1992. Croatia, Czech Republic, Denmark and Malta join the network and RE/MAX hits the 1,000 sales associates mark in Europe. With RE/MAX signs in the Baltic States, Bulgaria, Finland, Hungary, Romania and Slovakia, RE/MAX undoubtedly is the fastest growing real estate franchising company in Europe. RE/MAX 365 – RE/MAX introduced RE/MAX 365, a comprehensive program designed to connect Sales Associates to the best tools for success, including the “RE/MAX Ultimate Agent” program designed by Buffini & Company for agents earning between $100,000 and $500,000. RE/MAX 365 also includes Connecting to Clients, comprising video and print messages that agents can send to current and potential clients to demonstrate the value of RE/MAX. Emphasis on Distressed Properties – RE/MAX University re-focused much of its content to emphasize the distressed properties market. RSN debuted the “Distressed Properties Expert” course and ATOD introduced the “Distressed Properties” channel. For the ninth time in 10 years, Entrepreneur magazine named RE/MAX the top buy among all real estate franchises.